Bob Gill has been singing since his early pre school years and has performed in a varied phases from a one man band show incorporating the use of floor bass, guitar and beat box to a six piece cover country band. He has performed in Nashville and other venues across North America attracting growing audiences along the way. He has several albums to his credit and became interested in Waylon's music when he first heard him in the early seventies and since then has amassed a repertoire of most of the songs ever recorded by Waylon. 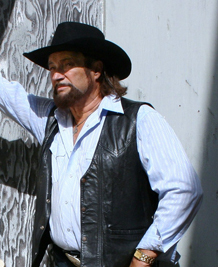 During his travels, he increasingly became compared to Waylon in both appearance and vocal style. Since Waylon's untimely death in February 2002, Bob has had an inner desire (and destiny) to focus exclusively on preserving for eternity the music of his idol. When you hear Bob sing Waylon's music and close your eyes, you are immediately positioned in the midst of fans at any one of the late and great performer's concerts. Bob, like Waylon, sings with a style that seems to come from the soul and reflects both the joy and pain of a man who has experienced each. Born in in a small village, near Yarmouth Nova Scotia, Guy began playing music around twelve years old. Taking up guitar first, then banjo, mandolin and fiddle. At thirteen he got his first paying gig at a local restaurant/dancehall. Moving to Toronto in his late teens, Guy immediately began playing the country bars, and, worked as a Studio musician for Marathon Records. After a few years, he went on the road as a touring musician, across Canada and U.S. Moved to Woodstock, Ontario and formed a very successful country band "The Boss Gang", all the while, still involved in recording. Guy is an accomplished musician and his expertise on guitar is well noted in his performances. Guy says, "When I first heard 'On The Road Again', I said "that guitar sure sounds like my style of playing". Meanwhile people were commenting how much his natural voice sounded just like Willie Nelson's. That is when the tribute shows began. 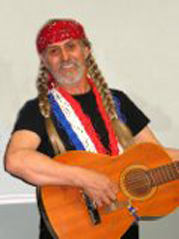 Now he travels across Canada with his show, 'Just Like Willie', which is very well received by audiences of all ages. swing of things when he joined "The Sun Records Story". 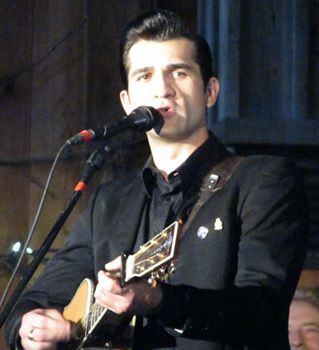 In his Johnny Cash persona Yorfido also includes some of Cash's later recordings with producer Rick Rubin, particularly his cover of "Hurt" by "Nine Inch Nails" as well as many of the late Icon's hits. Yorfido's portrayal of Cash has always and continues to grasp the immediate attention of Johnny Cash fans everywhere and has won him many accolades of praise. Vocally his striking baritone voice is a rarity among Cash performers; He actually has the exact same vocal range as "The Man in Black" himself and he meticulously successfully re-creates the distinctive look of the "Man in Black."